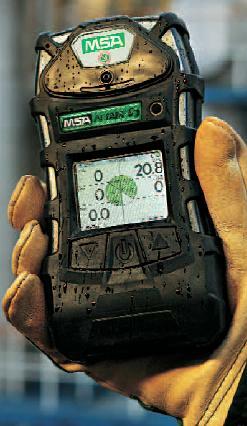 This product is now obsolete and has been replaced by the Altair 5x Multigas Detector. The newest member of the ALTAIR family of portable gas detectors is equipped with 6-gas capability, large high-resolution display,18 pre-programmed languages and a 24 hour bump-test checkmark. On top of this ALTAIR 5 comes with an optional brilliant full-colour display. The Wireless USB option enables the integration of ALTAIR 5 into the alpha Personal Network. This monitoring and alarm system consists of modular and wireless components that can be individually integrated to enhance your operation's safety and capability as needed. With the ALTAIR 5 gas readings and alarms can now be transmitted and displayed for the first time ever in realtime. The optional GALAXY test and calibration system, low flow auto calibration and easily replaced sensors minimise the cost of ownership without compromising on performance.